Bolina Blogger Template is a first blogspot theme that work solely on shortcut codes. It is a multipurpose blogspot theme which is ideal for traveling, blogging, photography, technology, personal and indeed a fashion blog site. It comes with three different demo layouts. All you need to choose the desire ones which look a perfect choice for your blogger site. 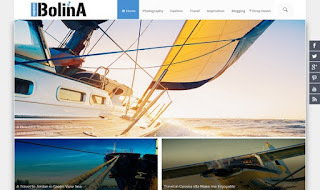 Bolina is purely adopted from Html5 theme and become a dynamic, SEO friendly and awesome design blogger template of 2016. It has advance features like, shortcut codes, auto sliders and dynamic homepage layouts. All these features makes it unique and professional template. Apart from these, Bolina is coded wisely, So you can customize this theme to develop your own design for a site.